ASAP Bail Bonds Greeley CO has the professional bail bondsman you need to get your loved out of jail fast if they are arrested in Greeley. We have the knowledge and connections necessary to get your loved one back home faster than any other bail bond company out there. ASAP Bail Bonds Greeley has local Greeley bail bondsmen to provide fast and easy bail service to the Weld County jail. Call us 24 hours a day (970) 378-7878 to get in touch with a local Greeley bail bondsman near you to see how ASAP Bail Bonds Greeley can help you! Once you have received the call and your loved one is in transit, you should call your local Greeley bail bonds company to see what is required to secure the bail bond, the bail bondsman can give you a quote on what it will take to post bond for your loved one. Furthermore, the process is not quite over from there. Before the bail bondsman can start any paperwork or call the Weld County jail, they must wait for the person that was arrested to be fully booked into the jail. The booking process includes taking mugshots, fingerprints, and then running their name to check if the person has any other warrants outside of Greeley that they will need to be held on. Depending on how busy the Greeley’s jail is, it takes roughly 2-4 hours to be booked in. Beside that, you must take into consideration that if it is a busy night for the Greeley police department and they are bringing loads of individuals into the jail, it often takes longer to book them in. Once they are booked, you should get back in touch with your local Greeley bail bondsman to let them know the friend or family member is ready to be bonded. You will be able to tell if your loved one is booked by calling the weld county jail (970) 356-4015 and speaking their name into the phone system. If they don’t have someone by that name, chances are they are not booked. Weld County Jail updates the phone system roughly every 15 minutes. Alternatively you can visit: Weld County Inmate Search. Once the bail bondsman calls the jail to confirm the charges and bond amounts, they schedule an appointment with the jail to have them start working on the bond. At this point, the bond is all typed and ready for the bail agent when he or she arrives. The average amount of time it takes the jail to type the bail bonds is typically 45 minutes to an hour and a half depending on how many releases, new bookings and other bonds are going in and out. In the meantime, you should start planning to meet with the bail bonds company you choose to work with. Most local Greeley Bail Bonds Companies like to meet at the jail so you can see them do their job and get a copy of the bail bond with the upcoming court date on it. Note: Many 24-hour bail bonds companies get short-handed in late hours of the night due to high arrest rates at night. Once you meet up with the bondsman, you will have to fill out a few documents and provide your Colorado ID card and most recent pay stub. From here, the first document signed is the cosigner application. Next, you will be asked to sign a bail bond contract. After that, you will sign a document stating what, if any, collateral was taken to secure the bail bond. Lastly, you will sign a receipt that shows how much you paid for the bond. No bond shall cost more than 15% of the bail amount, as set by the State of Colorado Law. Read all documents to make sure you know exactly what you sign. Bail bond paperwork takes 10-20 minutes, depending how many bonds there are. Once the paper work is all filled out and signed, the bonding agent goes down stairs into the Weld County jail to post the bail bond. Since the bond has been posted, the jail will start working on releasing your loved one. This process typically takes 2-6 hours, depending on how busy the jail is. Therefore, it is highly recommended to go back home to relax and wait for your loved one to call right before they get released. You will have to pay a $10 non-refundable bond fee and a $30 booking fee at the time bail is made. If you have any other questions on how the Bail Bonds process works in Greeley, please call ASAP Bail Bonds Greeley to get more information on how we can get your loved one out of jail as fast as possible! (970) 378-7878. When your loved one is taken into custody in Greeley Co, they will most often be taken to the Weld County North Jail Complex, located at 2110 “O” Street in Greeley. You will have to pay a $10 non-refundable bond fee and a $30 booking fee at the time bail is made. What Is A Misdemeanor in Greeley? What Is A Felony In Greeley? 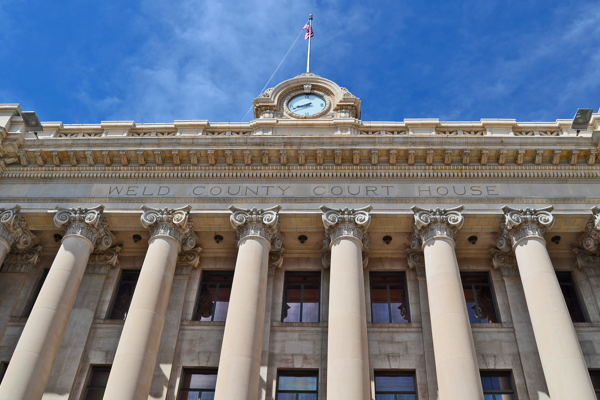 Greeley CO is the most popular city in Weld County. It is located in northern Colorado and is positioned 49 miles north-northeast of Denver. The population of the city is 100,883 and is the 12th most populated city in the state. Greeley is bordered by the towns of Garden City and Evans. The three are often referred to as Greeley. It is bordered on the south by the South Platte River. The Cache la Poudre River flows through the north section. The intersection of U.S. Highways 85 and 34 is often cited as the location of Greeley but the intersection is within the city of Evans. Greeley was named after Horace Greeley. He was the editor of the New York Tribune and came to Colorado in 1859 during the Pikes Peak Gold Rush. Greeley was built on farming and agriculture and has kept up with modern technologies. Telephones were in town in 1883 and electric lights 1886. Automobiles were in town in 1910. In 1969 a vote to allow the sale of alcohol passed by a mere 477 votes. Greeley is still growing today and its population has more than doubled since 1970. Greeley is home to the University of Colorado. We understand that it could take quite a long time for your loved one to stand trial, and it is always better to have them at home while they wait for their day in court. If your loved one is ever arrested in Greeley Colorado, it is crucial that you contact ASAP Bail Bonds Greeley right away for assistance. Beginning right away, we will work on your loved one’s behalf to get them out of jail and back home. Don’t suffer through the anxiety and uncertainty caused by their arrest, allow us to relieve your burdens and begin working toward a solution.